Whoosh, and it’s already March. Seriously? I’d have thought my cutting back on convention travel this year would have meant that time passed more slowly. Nope. Clearly a flawed premise. And as proof of the ol’ time and tide line, here’s another installment of EATING AUTHORS. This weeks guest is Sue Burke, a journalist for forty years, translator, poet, and short story writer. 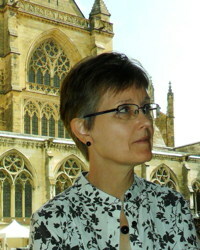 Sue currently lives in Chicago and last month saw the publication of her first novel. 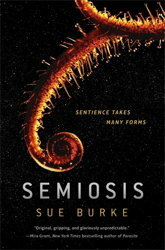 Semiosis is a tale of first contact, alien plants, and language in all its vastness. This is my favorite kind of science fiction (okay, so I’m biased). It’s going to change the way you think about meaning and communication. 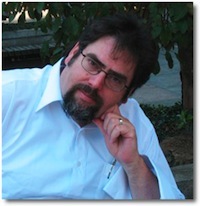 LMS: Welcome, Sue. What’s your most memorable meal? SB: My most memorable meal is a mere snack – memorable for what it proved. In the mid-1990s, my husband and I visited Paris, where we had a delightful time enjoying the art and history, two of our favorite things. Of course, one of the first stops we had to make was to visit the Eiffel Tower – to see for ourselves its astonishing size, understand more deeply its architectural and cultural importance, and enjoy the view. And we needed to be able to say we’d been there and done that. Who could visit Paris without visiting the Eiffel Tower? We were there in fall, though, and the weather was … autumnal. We spotted a little pastry café while we were up in the tower and thought we could get a snack there and brief shelter from the drizzle and wind. On the level just below, however, we had seen a souvenir stand with some disturbingly third-rate offerings, so we expected the food and hospitality to be on a par with a yellow foam-rubber replica of the tower. We were at a tourist trap, n’est-ce pas? Part of the duty of a good tourist is to be attentive and learn. We had heard, as everyone does, that the French put pride and care into their food. It turned out to be true. Even when they didn’t have to, they served a superb little repast. What did that tell us about the culture and the character? Why were they selling crappy souvenirs and perfect pastries almost side by side? We puzzled over that as we ate, and we could reach no conclusion, which was part of the fun. We had done what tourists long to do: we had caught a glimpse of the real France. We’ll always have Paris – and the memory of a small perfect snack at a grand iconic place in a city that made sure it lived up to one of the best parts of its reputation. Thanks, Sue. So much of human perception is defined by contrast. I wonder, perhaps the placement of that souvenir stand was deliberate, just to heighten the experience of the pastry? This entry was posted on Monday, March 5th, 2018 at 7:30 am	and is filed under Plugs. You can follow any comments to this entry through the RSS 2.0 feed. You can leave a response, or trackback from your own site.